Sanel NAPA is a leading auto parts, heavy-duty truck parts, and body shop supplies distributor with over 42 store locations throughout New Hampshire, Vermont, Maine, and Massachusetts. We deliver quality car parts, heavy-duty truck parts, automotive paint and body supplies, and tools and equipment that are durable, dependable, and long-lasting in order to provide our clientele with the best products and services possible. Sanel NAPA employs a knowledgeable, professionally trained team of automotive experts that assist professional mechanics, service garages, and individual customers with finding the right products and solutions that fit their needs. We are an auto parts store that is dedicated to honesty and integrity from our products to our services, right down to our commitment to high customer service standards. Sanel NAPA has established a reputation for exceptional customer satisfaction in the automotive industry. 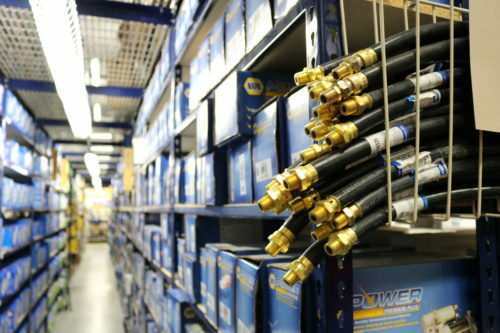 We pride ourselves in getting the job done right the first time which is why we strive to deliver unmatched products, prices, and selection from an auto parts store that you can trust. Sanel NAPA’s mission is to be the best at providing quality products and services to all segments of the automotive industry, and vehicle repair and maintenance market. It all started in 1920 when Benjamin Sanel and Edward Sanel Sr. founded Sanel Auto Wrecking Company in Concord, NH. This small company sold new and used auto parts, as well as scrap iron and metal. Their vision was to supply customers in northern New England with the highest quality car parts in the automotive repair business. Three generations later, we have not forgotten our roots or the principles that the company was founded on. We have grown our auto parts business over the years and now have over 42 store locations throughout Maine, New Hampshire, Vermont, and Massachusettes. During this time, Sanel’s goal has not changed. We put emphasis on loyalty, integrity, and devotion; ideals that are often forgotten when servicing customers in today’s constantly changing, high-tech world. We cater to professional mechanics and service garages looking for quality car parts, heavy-duty truck parts, automotive paint supplies, and tools and equipment, as well as the individual customer looking to repair their own vehicle or remodel a classic. Our team of automotive experts is professionally trained to know what the customer wants and needs, 100% of the time.